Bronson broke his glasses in a "control and restraint incident"
One of Britain's most infamous prisoners has received up to £200 in compensation from the Prison Service after having his spectacles broken. Charles Bronson's glasses were smashed during an incident involving two members of staff at Full Sutton high security prison in East Yorkshire. 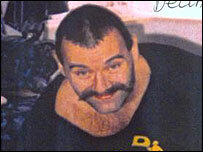 Bronson, 54, from Luton, was first jailed for armed robbery in 1974. Since then he has held fellow prisoners and staff hostage on three occasions and carried out several assaults. It is unclear what happened in the incident which led to Bronson's glasses being broken, but a HM Prison Service statement described it as a "control and restraint incident". The statement said: "A prisoner has been offered compensation of under £200 after a control and restraint incident." Bronson - who changed his name by deed poll from Michael Peterson in the 1980s - staged a 47-hour rooftop protest at Broadmoor in 1983, causing £750,000 of damage. In 1994, while he was holding a guard hostage at Woodhill Prison, Milton Keynes, he demanded an inflatable doll, a helicopter and a cup of tea as ransom. Two months later, he held deputy governor Adrian Wallace hostage for five hours at Hull Prison, injuring him so badly he was off work for five weeks. In total, Bronson has been held at all three of Britain's security hospitals and at least 28 conventional prisons. However, in 1995 Bronson won the literary Koestler award for his writing about prison life called Living Legends.